Protect your private files from being accessed by malware without your knowledge. – How to protect files from access and modifications. – How to use files and folder protection to keep your sensitive data safe. 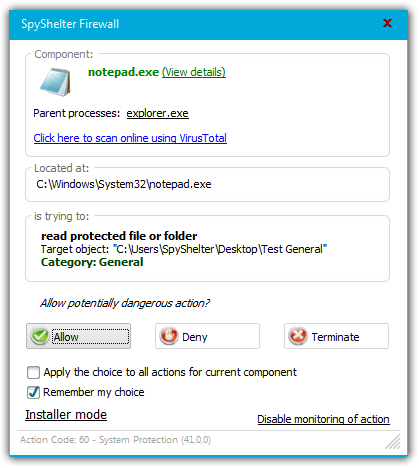 By default SpyShelter protects critical system files. With Protected Files you can define your own list of file and folders and protect your sensitive data against unauthorized access, for example by ransomware. 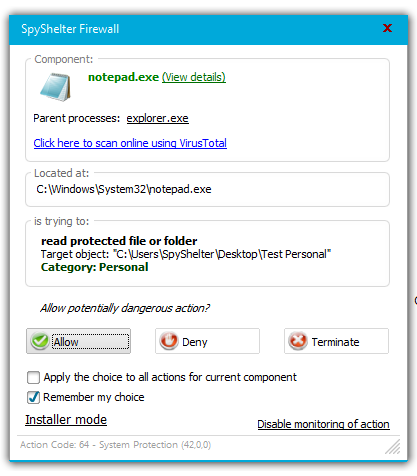 SpyShelter will prompt an alert window if one of the listed files will be accessed by a process. Each new process which will try to access the file will generate new Alert window. The alert can show up on Read attempt or Read&Write attempt. There are two categories of protected files – General and Personal. Let’s explain how to use it on an example. We have four folders. Two of them are set to General, the other two to Personal. If User tries to open the .txt file from the General folder, an alert window will appear saying that Notepad.exe (or any other application assigned to open .txt files) is trying to get Access to Read this file. If user allows this action, the Notepad application will immediately gain access to all files which are placed inside General category on Protected Files list. If user attempts to run the same file for example with Open Office, the alert will show up again because it is a process based solution. After creating a rule for Notepad.exe which allows executing files from “General” category, an attempt to execute a .txt file from a folder from “Personal” category will result in another Alert window. You can also create a folder with Read&Write access with General category, and then specify files inside this folder with Personal category. The files from Personal category will prompt another alert requesting additional permissions, even if user selected “Remember my choice” option for the Read/Write action for any file under General category in that folder.